Sally Ride is best known as the first American woman sent into outer space, and she is also the youngest person ever sent into orbit. She has received numerous medals and honors for her work as an astronaut, and for her commitment to educating the young. Sally Kristen Ride is the older of two daughters of Dale B. Ride and Carol Joyce (Anderson) Ride of Encino, California. She was born May 26, 1951. Her father was a professor of political science and her mother was a counselor. Her parents encouraged Sally and her younger sister Karen to study hard and do their best, but allowed the children the freedom to develop at their own pace. In 1983 Newsweek quoted Dale B. Ride as saying, "We might have encouraged, but mostly we just let them explore." Ride showed natural athletic ability as a youngster, often playing baseball and football with the neighborhood children. Although she liked all sports, tennis was her favorite. She had developed her tennis skills since the age of ten. Ride eventually ranked eighteenth on the national junior tennis circuit. Ride's tennis ability won her a partial scholarship to Westlake School for Girls, a prep school in Los Angeles. From her earliest years in school, Ride had gotten straight A grades. She did a lot of reading, often science fiction. However, sometimes she did not apply herself to her studies. In her junior year of high school she became interested in the study of physics, through the influence of her science teacher, Elizabeth Mommaerts. After graduating from high school in 1968, Ride enrolled in the physics program at Swarthmore College, in Swarthmore, Pennsylvania. However, she continued to devote a large amount of time and energy to tennis and soon left college to work on her game full time. Tennis pro Billie Jean King (1943–) told Ride she had the talent to pursue a professional career in tennis. Ride eventually decided not to pursue tennis. Instead, she returned to California as an undergraduate student at Stanford University. She received a bachelor's degree in both physics and English literature in 1973. She also received her master's degree from Stanford in 1975. She continued work toward her doctoral degree in physics, astronomy, and astrophysics (the study of the physical elements that make up the universe) at Stanford and submitted her dissertation (a long essay written by a candidate for a doctoral degree) in 1978. At about the same time National Aeronautics and Space Administration (NASA) was looking for young scientists to be "mission specialists" on space flights. Ride applied and was selected for space flight training in 1978. She was one of only thirty-five chosen from eight thousand applicants. As part of her training, Ride had to study basic science and math, meteorology (weather and climate), guidance, navigation, and computers. She trained for flying on a T-38 jet trainer and other simulators (devices that are modeled after real crafts to create similar sensations for training pilots). Ride was selected as part of the ground-support crew for the second (November, 1981) and third (March, 1982) shuttle flights. Her duties included the role of "capcom," or capsule communicator. The "capcom" relays commands from the ground to the shuttle crew. These experiences prepared her to be an astronaut. Before Ride's first shuttle flight, George W.S. Abbey, NASA's director of flight operations, described her as an ideal choice for the crew. He noted that she had "an unusual flair for solving difficult engineering problems" and that she was a "team player." On the seventh mission of the space shuttle Challenger (June 18 to June 24, 1983), Ride served as flight engineer. With John M. Fabian she launched communications satellites for Canada and Indonesia. They also conducted the first successful satellite deployment and retrieval in space using the shuttle's remote manipulator arm. In this way, at thirty-one, Ride became the youngest person sent into orbit as well as the first American woman in space. Ride points to her fellow female astronauts with pride. She feels that since these women were chosen for training, Ride's own experience could not be dismissed as insignificant. That had been the unfortunate fate of the first woman in orbit, the Soviet Union's Valentina Tereshkova. Ride was also chosen for another Challenger flight led by Captain Crippen, October 5 through October 13, 1984. This time, the robot arm was used in some unusual ways. She performed "ice-busting" on the shuttle's exterior and readjusted a radar antenna. With this flight, Ride became the first American woman to make two space flights. Ride had been chosen for a third scheduled flight. Sadly, training was cut short in January 1986, when the space shuttle Challenger exploded in midair shortly after take-off. The twelve-foot rubber O-rings that serve as washers between steel segments of the rocket boosters failed under stress. The entire crew of seven was killed. Ride was chosen for President Ronald Reagan's Rogers Commission, which investigated the explosion. Perhaps the most important recommendation the commission made was to include astronauts at management levels in NASA. As leader of a task force on the future of the space program, Ride wrote Leadership and America's Future in Space in 1987. In her report she said that NASA should take environmental and international research goals into consideration. Ride said NASA has a duty to inform the public and capture the interest of youngsters. She cited a 1986 work that described the lack of math and science skills among American high school graduates. A mere 6 percent are fluent in these fields, compared to up to 90 percent in other nations. Ride left NASA in 1987 to join Stanford's Center for International Security and Arms Control. Two years later she became physics professor at the University of California in San Diego (UCSD) and director of the California Space Institute. In the summer of 1999 Ride joined the board of Directors of Space.com , an Internet site devoted to news and information on the cosmos. She left that position a year later, to spend more time in science education. Ride has followed through on her commitment to science education. In her own high school years, she discovered how important it was to have a mentor (advisor). She felt so strongly about the positive influence Mommaerts had on her that she dedicated her first children's book to her former teacher. Ride coauthored two children's books, To Space and Back, and Voyager. In 1998 Ride developed EarthKAM, an innovative project for studying natural phenomena (occurrences). This is a unique program for students in middle school through college. Students research a natural phenomenon on Earth and take pictures of it with digital cameras mounted in the crew cabins of NASA space shuttles. The pictures are then downloaded from the Internet into the classroom. Over ten thousand students from all over the United States participate in EarthKAM. In 2001 Ride formed Imaginary Lines, a company dedicated to encouraging young women interested in the sciences. Through the Sally Ride Science Club, young women in the fourth through eighth grades will be able to network and hook up with mentors. To quote UCSD chancellor Robert Dynes in the Los Angeles Times, August 29, 1999: "Sally's a hero at bringing the excitement of science into the classroom. Many children today never experience a full-blast spirit of discovery. Sally teaches kids to go for it. Flat out. That's the magic." Camp, Carole Ann. 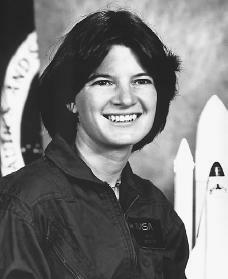 Sally Ride: First American Woman in Space. Springfield, NJ: Enslow, 1997. Hopping, Lorraine Jean. Sally Ride: Space Pioneer. New York: McGraw-Hill, 2000. Hurwitz, Jane, and Sue Hurwitz. Sally Ride: Shooting for the Stars. New York: Fawcett Columbine, 1989. O'Conner, Karen. Sally Ride and the New Astronauts: Scientists in Space. New York: F. Watts, 1983. Ride, Sally, and Susan Okie. To Space and Back. New York: Lothrop, Lee, and Shepard, 1986. Nice article, but you do have a couple of facts wrong. The statement of "In this way, at thirty-one, Ride became the youngest person sent into orbit as well as the first American woman in space." If you do the math you will find that she was in fact thirty-two years old not thirty-one, Dr. Ride had been thirty-two for nearly a month by the time she went into space. Next you have here written,"On the seventh mission of the space shuttle Challenger," This statement is incorrect, it was the seventh Space Shuttle mission, but only the second mission of the Space Shuttle Challenger. That's just what I happened to notice.. Thanks.